Marquee weddings can give you a lot of flexibility in deciding where you want your reception and the style you want it to be. Becoming increasingly popular, hosting your wedding in a marquee allows you the freedom to be creative and produce the best of both worlds- a cosy environment decorated in your style whilst saving you money. First of all, you need to consider the style of wedding you want to create, as this will affect the type of marquee that you will hire. You may want a garden based reception, in which case you can have a traditional tied marquee, or giant tipis for a rustic, quirky wedding. However, if you are considering a marquee on hard grounds (i.e. courtyards) you will need a frame marquee to hold the structure. Once this is decided, you can let your imagination run wild with the décor! With weather in Northern Ireland and Ireland being unpredictable, rain could be possible throughout all of the seasons. Even if you are having an August reception on a balmy summer’s night, it’s best to be prepared in the eventuality of rain! A good thing to consider would be wooden floors if it is to be wet, to avoid any ladies heels sinking into the ground or mud being trailed through the venue. For a cool winter’s evening be prepared to hire a heater. Nonetheless, we can’t predict the weather too far in advance, it could be a blazing hot summer’s day- in which case be prepared to have air conditioning installed, as it can certainly get hot with hundreds of guests in a smaller space. 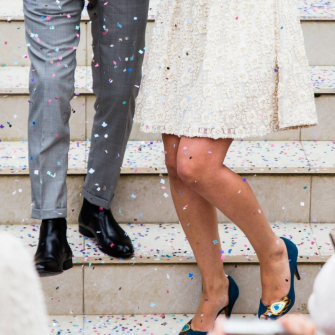 Although it’s great if you can create some aspects of your wedding décor through DIY to save on cash, we recommend calling in professional wedding planners or events decorators to make things stress free. 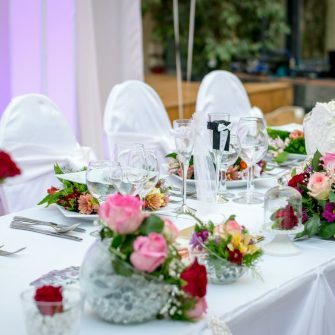 There are many aspects of organising a marquee wedding that you have to organise that you may have never thought of- a planner can decorate the marquee, take delivery of goods, help with vehicle access and manage the operations. Hiring a wedding decoration company can ensure you get an A-list look transforming blank canvases into amazing spaces, in whatever style you choose, whether it be ethereal and floral, classic and elegant or shabby chic and rustic. An important factor to consider, especially if you are having over 100 guests, is to think about designated areas for parking, for not only guests but also for back-of-house wedding suppliers. You may want to use the local village car park or a hotel carpark with a shuttle bus arranged to pick guests up. Alternatively, you may have a field that could be used for parking in the adjacent area. In this case, ensure that there is a solid and well-lit walkway with clear signage for guests to find their way. Not the most glamourous side of organising a marquee wedding, but an essential! With large amounts of guests, you will need to hire mobile loos- many marquee companies offer these as an extra price on the venue hire and offer to sort out all the mains and generator issues. Double check with your marquee provider before booking that they can offer this service. You may have great plans with the lighting of the marquee, particularly in the evening so also check they can provide you with a generator that is essential for catering. The beauty of marquees is the ability to create unique spaces that suit your wedding and personal style. With so much height to play with in a marquee, try and use the ceilings to create a unique look and a dramatic entrance for your guests. You could use hanging lanterns, buntings, elegant crystals and chandeliers, floral creations or simple drapes. It’s a great opportunity to get creative and play around with styles! 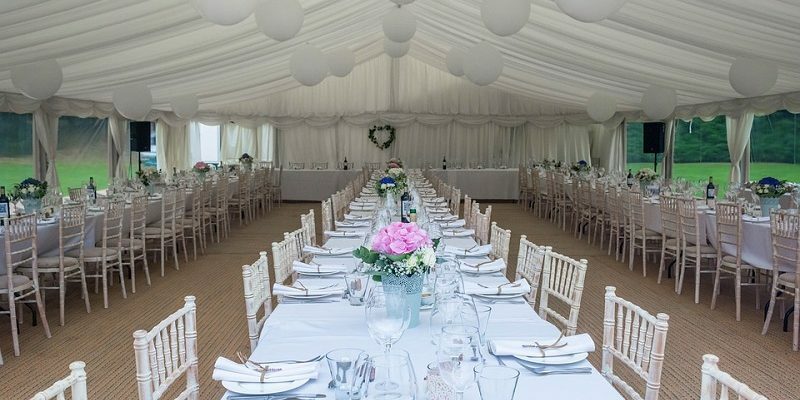 Hiring a marquee also means hiring a caterer, often marquee companies will have suggested suppliers however do your research and make sure they can offer the type of dining you would like to have at your reception. Whether you want a hog roast or a buffet style meal for guests, ensure they cater to your needs. Catering may also determine seating plans whether you want a banquet style layout or round tables. Be prepared like Pippa Middleton & James Matthews, who are set to marry in a luxury glass marquee on Saturday, where they have taken the ‘sunshine and shower’ prediction into consideration to avoid any mucky feet with an extension marquee for the drinks reception… that’s one marquee wedding we can’t wait to see!